The fashion industry as we know it isn’t doing the planet any favors. Clothing production doubled from 2000 to 2016 to keep up with shoppers buying higher volumes of cheaper clothes. If we keep going at this rate, the fashion industry could eat up 26 percent of the carbon budget the world needs to stick to in order to keep global warming below 2 degrees Celsius by 2050. But change could be coming. The Global Wellness Institute, a nonprofit that aggregates and analyzes wellness research, just pegged “Well Fashion” as one of its 2019 trends, claiming all signs point to a new era of sustainable, ethically made, and inclusive clothing: “We think 2019 will be a watershed year where more people will trade in the addictive endorphins of manic fashion consumption for the serotonin (true peace and happiness) of buying slower and choosing clothes with values and meaning,” the trend report reads. Last week, world leaders in fashion and beyond gathered at the United Nations to discuss how to get these types of clothes into people’s hands. 1. Supply chains are becoming more transparent. The diverse array of speakers at the summit all agreed that the responsibility to advance eco-fashion can’t fall squarely on the consumer. Brands need to take a harder look at their supply chains and be more transparent about where their clothes are coming from. This will make it easier for people to buy items that align with their values, without needing to go down a rabbit hole Google search every time they go shopping. 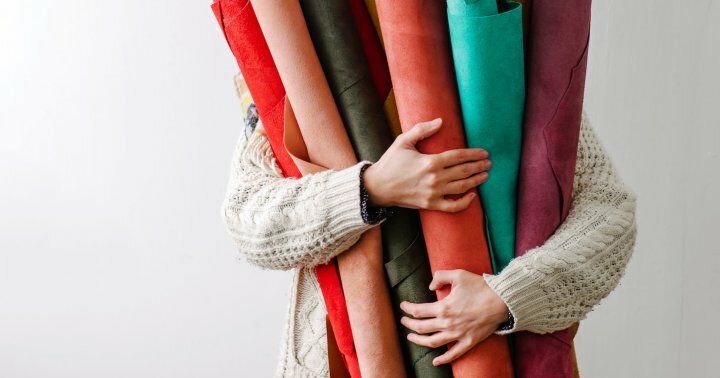 A few companies leading the way in traceable, ethical supply chains right now include Behno, sustainable leather handbags made by female garment workers in India; Naadam, hand-combed cashmere from a traditional farm in Mongolia; Veja, sneakers from Brazil made from organic materials; and Amour Vert, a line of luxe basics made in California. Larger brands are starting to retroactively weave traceability into their DNA these days too, with Madewell and J. Crew just unveiling Fair Trade–certified denim collections. 2. We’re starting to reuse materials again and again. While natural materials like organic cotton and linen are more sustainable than petroleum-based synthetics like polyester, we won’t be able to grow them forever. Industrial agriculture depletes essential soil nutrients, and Slow Factory‘s founder Celine Semaan told the audience at the U.N. that we likely have only 60 harvests left until our farmland is no longer able to support this type of production. The industry needs to stop relying on these new materials, also known as virgin materials, when making clothes. “We don’t need virgin materials to make amazing products,” Dio Kurazawa, founder of The Bear Scouts, an eco-consultancy for high fashion brands, told the U.N. Instead, designers can promote a more circular economy by reusing fabric that has been discarded, either by the consumer or the designer. For inspiration on how this can work, you can look to Eileen Fisher, which collects shoppers’ old clothes to either resell or break down and remake into new pieces, and Christy Dawn, a trendy dress brand that works exclusively with deadstock fabric that other designers didn’t need. 3. Our wardrobe choices are becoming a means of activism. Slow Factory, a line of garments printed with politically significant imagery and slogans (scarves and necklaces that depict endangered species; flight jackets with the Declaration of Independence written in Arabic) demonstrate how we can use fashion to spread an important message. “I thought if we could wrap ourselves in it, maybe we would understand it,” Semaan said of the idea behind her brand. Lately, we’ve seen more instances of clothing becoming cultural commentary—whether it’s pink hats at the women’s march or Viktor & Rolf’s viral “Fashion Statements” show that poked fun at the age of Instagram. 4. Big Tech is coming for our fashion—but it’s treading lightly. Leather and diamonds are now being grown in labs. Outerwear that can charge cellphones is coming. Carling just released an entirely digital collection so people can photograph themselves in new clothes, even if they don’t want to actually buy them, and Dyne‘s menswear is embedded with codes and doesn’t require any paper tags for scanning. The future of fashion is looking high-tech, but Dio Kurazawa reminded the crowd at the U.N. that it needs to exist in a way that still creates jobs in the industry. 5. Unlikely partnerships and spokespeople are arising. One panel at the Summit had a motley crew of speakers, including but not limited to a NASA astronaut, the dean of Parsons School of Design, and an Olympic skateboarder. It proved that if the industry is really going to change, more voices need to be brought to the table.